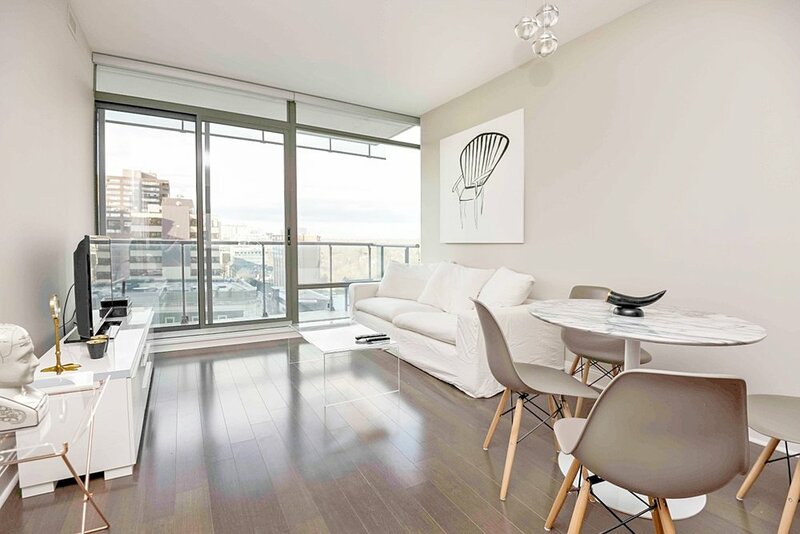 A beautiful 1 Bedroom + Den furnished apartment, in the heart of Yorkville. You can walk to all your favourite Yorkville destinations. Live in the best area of downtown Toronto. 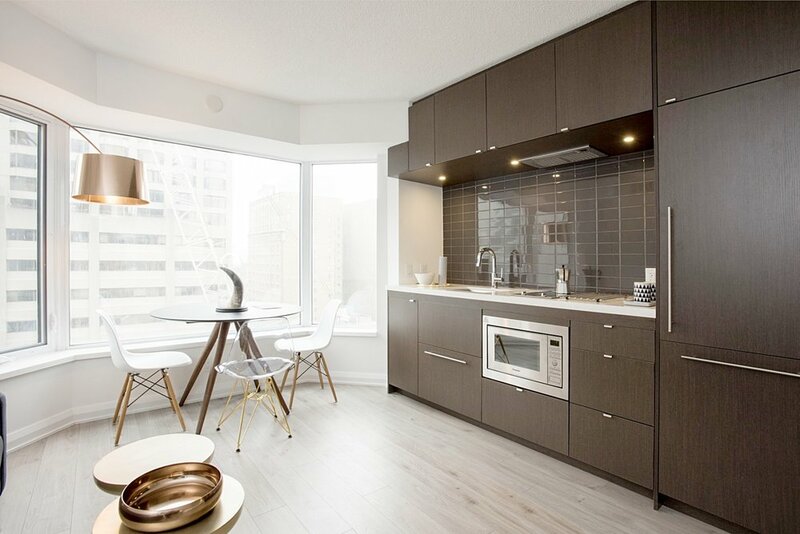 A new stylish 1 Bedroom + Den furnished rental for a busy business traveller. Located at Queen Street and Bay in Toronto's financial district, it is quite large and has many nearby attractions. 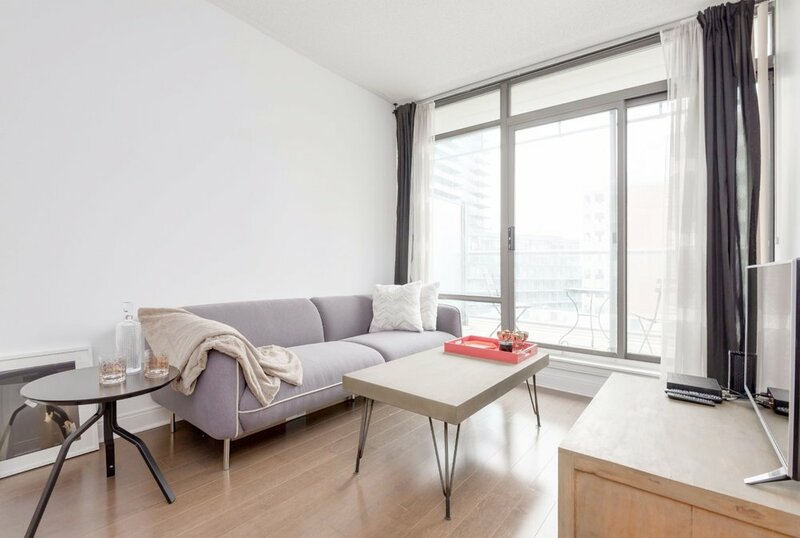 A loft-style 1 + Den furnished rental Toronto on King Street West, huge 870 Sq Foot space, sleek concrete floors, floor to ceiling full length windows that provide a stunning view of downtown. Modern Toronto furnished rental in Yorkville and outfitted with designer furnishings. A very private 1 Bedroom suite with cherry hardwood floors throughout and overlooking a beautiful urban park. 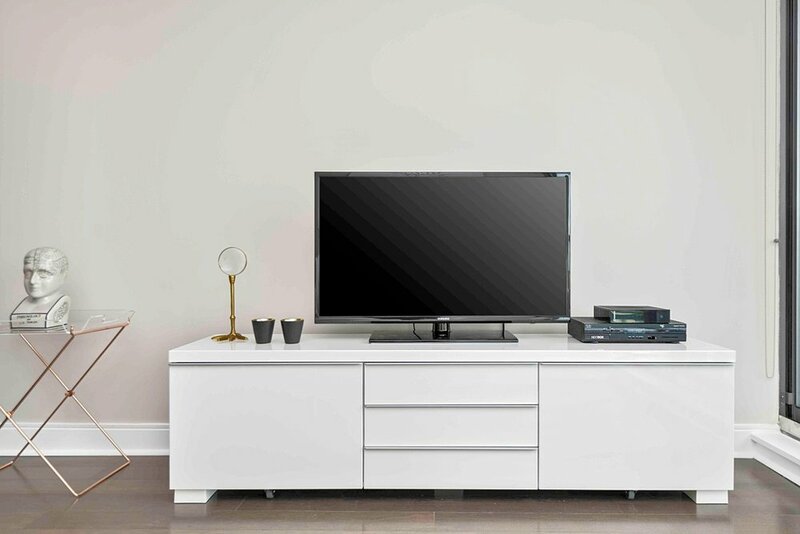 This furnished apartment is in Yorkville, it has a great view and comes with premium furniture. It is a large space (620 Sq Ft), features hardwood, and a full balcony. Experience Yorkville luxury! This furnished apartment is on Bay Street, it has a great Downtown and comes with sleek furniture. It is a large space (690 Sq Ft), features hardwood, and a full pantry. Experience. Premium 1 Bedroom Toronto short term rental, with all new furniture. Located near Yonge and Bloor, next to the new Four Seasons Hotel. Live in the best part of downtown Toronto. A luxury condo with classic style furniture, this One Bedroom + Den in Yorkville is ideal for executive short term stays. It is located beside the Four Seasons Hotel, very walk-friendly and 2 minutes from the subway. 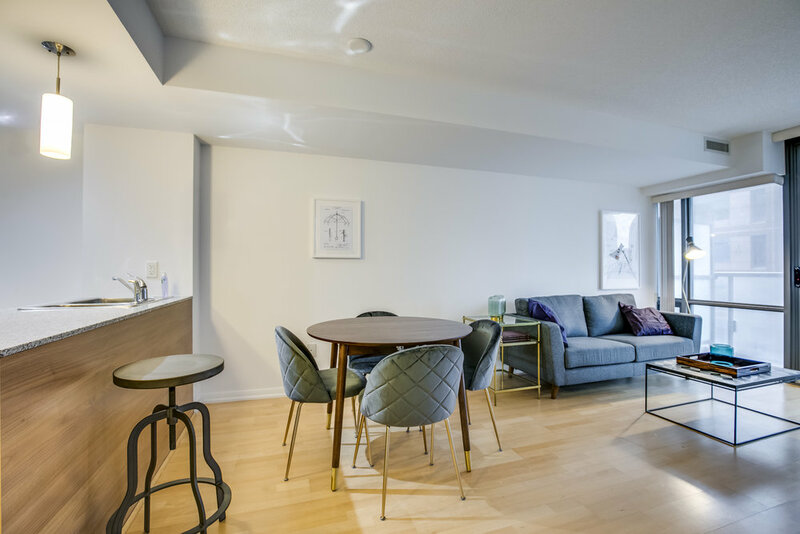 This Toronto furnished apartment provides the ultimate comfort and convenience. It is a large condo that is fully stocked, the furniture is amazing and the location is unbeatable. 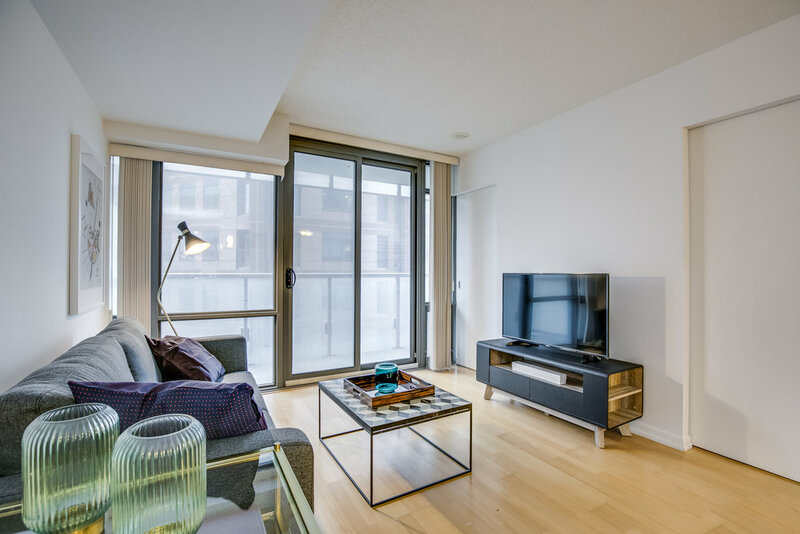 Very spacious 1 Bedroom + Den Luxury Condo – This Yorkville Furnished Condo is a Fully Furnished 1 Bedroom plus Large Den, with a premium sofa bed in the central part of Yorkville. The College Furnished Condo building offers excellent facilities including a full gym and swimming pool. The fully furnished condo is extremely bright has a large balcony and windows that provides a stunning view of College Street. Enjoy the tremendous space this spectacular furnished apartment Toronto suite has to offer, along with the breathtaking view of Bay and Charles Street. It is located near the Manulife Centre and Bay Station. Stunning 1 Bedroom Yorkville furnished condo. 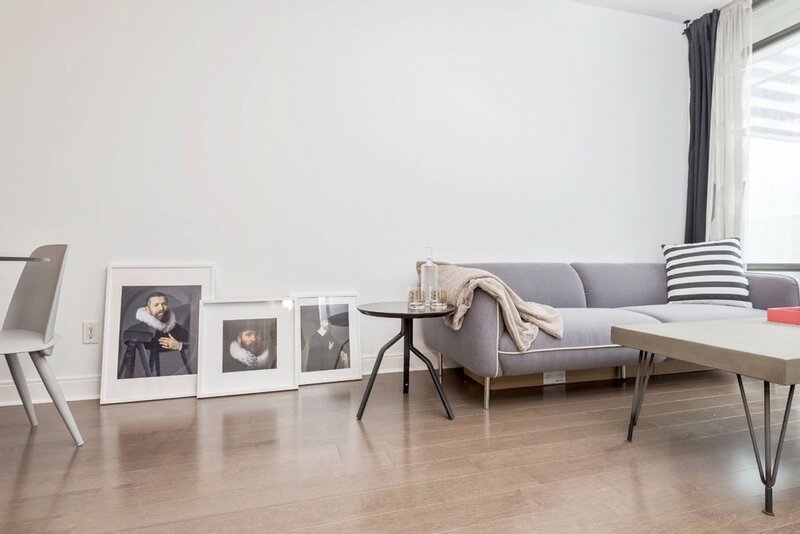 A peaceful, modern furnished rental, near Bay and Yorkville Avenue. Enjoy all the nearby luxury amenities, including Equinox Gym, and Whole Foods Market. An Open and very bright 1 Bedroom, 1 Bathroom condo, features a Queen size bed, granite counters and floor-to-ceiling windows. Enjoy the city’s best destinations within a 10-minute walk. Beautiful 1 Bedroom + Den unit near College Street, this is a bright luxury condo in downtown Toronto. It is walking distance from all the major hospitals, and Yorkville. Lots of space and a terrific view. A modern furnished bachelor suite, it is new, upgraded and in the best location! This rental condo is across the street Yorkville Village Center where you will find Whole Foods Market and Equinox. This is a very easy and stylish condo, perfect location, lots of interior design details that make it quite unique. It is practically right across from the subway station so you can commute easily to work! This Church Corridor Furnished Rental is in a brand new furnished condo with ample natural light and upgraded interior fixtures. 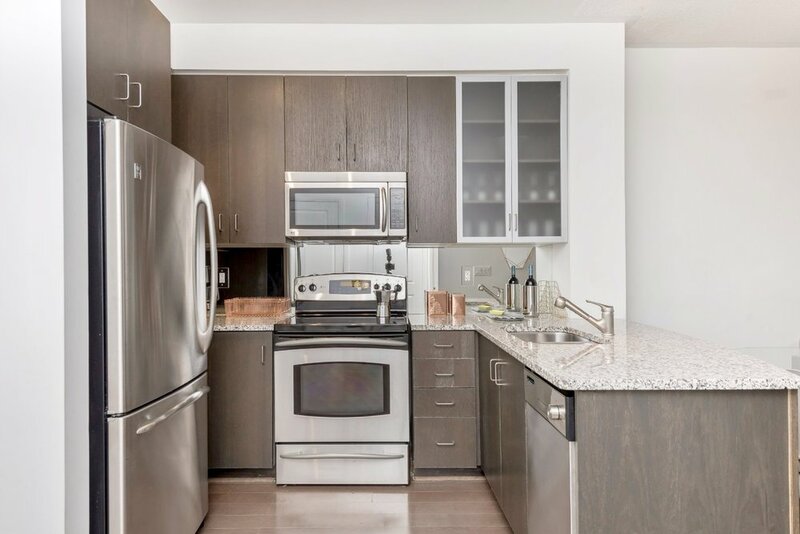 Located in a newly built condominium tower at College and Yonge Street. Join our VIP group to receive our seasonal discount emails, and new properties. Thanks for viewing our 1 Bedroom apartments!